CONTINENTAL Professional - You're Choosing Quality. Every product in the CONTINENTAL Professional range has been specifically designed for the needs of foodservice professionals. The range provides quality products whilst ensuring maximum yields and no wastage. 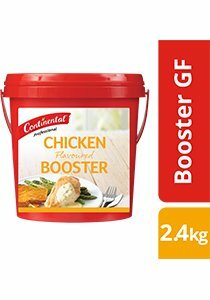 Use CONTINENTAL Professional Boosters as a savoury flavour base or to add more flavour during cooking. Servings per package: 960. Serving size: 2.5 g makes 100 ml.